GetMeVino! also known as PreVino has undergone some changes and is better than ever. GetMeVino! 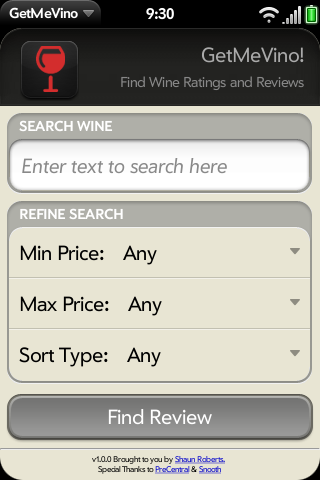 is a quick resource to find great ratings and reviews while your out in the wild world of wine. Simply put in the wine or variety your searching for and GetMeVino! searches Snooth.com for the content you need. GetMeVino! is currently a free application available to the homebrew community for beta testing. We strives to be a great wine reference with alot of user participation in future releases. I plan on making many additions to the application so stick around to see whats coming. Feel free to donate if you enjoy.